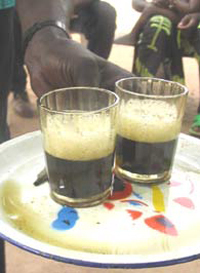 Traditional Food and Drink - Gambia! In Gambia the national alcohol drinking age is 18 years the same as in England, but very few people drink spirits as it not advised in most places. People in Gambia mainly eat fresh food which they grow themselves in fields or buy from local stalls/small shops in village markets. If family's cannot afford to buy from local markets the staple meal is rice and nuts, on the other hand if a family can afford it there is often a small supermarket type place nearby in which you can by basic foods, these foods are not as healthy as home grown items though. Every meal time if the meal has to be cooked it would be cooked over a fire in a metal bucket the complete oposite to the ovens we have here in England.